These are the most expensive pair of shoes that we have ever purchased for anyone in the family. Well, just to clear the air, we didn’t get a Prada or Gucci or Camper for Nathanael (wish we could), but we can’t afford designer shoes for Nathanael. 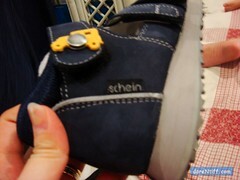 We actually bought Nathanael his first custom made, fitted orthotic shoes with in-soles from Schein. Its a German foot specialist company that has recently opened its retail chain in Malaysia. We accidently stumbled upon it at The Curve. Let us tell u why we got this RM1300 shoes for Nathanael . . .
You can scan your feet or your children’s feet at SCHEIN for free. FREE CONSULTATION! They are located on the Ground Floor of The Curve, best if u just ask the Concierge for their location, as they are situated behind another row of shops. They also have shops at Mid Valley Megamall & Lot 10. We discovered that Nathanael is flat feet (no arch) after the scan with Schein, and that both his ankles were not aligned, therefore when he stood, his feet were bent inwards. He had a bad case of Pronation or Valgus ankle (see brochure above) We learnt that all of us have some degree of pronation…..cos we wore the wrongs shoes as we were growing up. Who knew? The good thing is that Schein carries shoes for kids; adults too (There’s another foot specialist called Foot Solutions, but they only focus on adults). So we were really glad that we were able to get in-soles that will help correct Nathanael’s feet. We were informed (contrary to our belief) that shoes for kids should be hard solid. Good shoes should have hard “U Cup” back (to support the ankle) and only bent at the part where the toes are (to assist in walking). Yeah i know, we always thot that we should get comfy shoes, soft shoes, shoes that can bend easily for the kids. 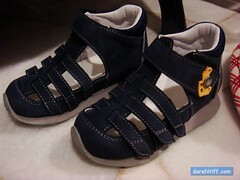 But actually those type of shoes DO NOT give the correct support & development to our kids ankle and feet. We also learned a new term called Foot Posture. >> See Nathanael’s shoes, on the right. The back of the shoes are of a certain height as it protects and supports the ankle. And if u touch it, you’ll realize that it is hard and it gives good support for healthy Foot Posture and of course in the long run good posture to your body. If we don’t correct the foot posture, the individual can grow up developing back problems and a whole lot of other discomforts. In fact Schein was telling us that adults who are now facing a back problems can get their feet scan and see if there’s a remedy for their discomfort. They can get custom made in soles! Sigh … i guess when we were all growing up in Malaysia, all we knew was BATA, Power, BM2000. And later during our youth, the likes of Fila, Nike, Adidas came in and we just thought those were the best to get (if we could afford it at that time). I am glad that Schein made in-roads into Malaysia and i guess they will have to do a lot of publicity to create awareness of Foot Posture, and foot problems and how actually shoes can correct them! So with all those facts in mind, we decided to put our money together and “invest” in a pair of Schein Shoes for Nathanael. We figured that the least we can do now is to help correct his Foot Posture. We had them custom made in soles so that it will help elevate a part of his feet to correct Nathanael’s posture and to eliminate the problem of flat feet. 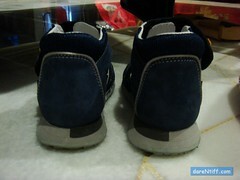 The shoes and the insoles cost up to RM1,300. We will have follow up visits to Schein every six months where they will evaluate Nathanael’s feet and posture and see if there’s any need to make any changes to the in-soles! Finally watch the video below, and see how Nathanael climbs up the stairs in his new Schein Shoes. Click play below or watch it here. Schein was founded in Remscheid, Germany in 1879 and is family owned in the 4th generation today. Schein orthopaedie service rank among the well known manufacturers of orthopaedic foot supports world wide. We are a team of well trained specialists, dedicated to help you to find foot comfort and pain relief. Many common foot problems are simply caused by mal-fitting shoes and a wrong posture of your feet. Wah… so expensive one ah? You should check on the internet. Malaysian companies really overcharge. You’re going to spend a lot of money before your boy is done growing. Similar (or maybe even better) products are available for much, much less – way under US$100. I bought an orthotic called Walkfit – very good. Yes .. Nathanael is Bullying me! But he so cute and look so helpless at times.. and he gives u the hush puppy look…. sigh!! Whoa. Okay .. Daren, it’s NEW comment NOTIFICATION ..
received your test note…..it works! 2nd hand only ah…….I thought can get brand new. HMm .. testing comment notification. Someone please reply to this? WOW!!! My parents would never buy me a pair of shoes that cost RM1300 🙁 But i guess it’s an investment la. Plus, with the velcros on the shoes, he can use it for quite awhile until the outgrows it. You should take a pic of the shoe from the top, show the readers the velcros. I think the velcros running from the front to the back of the shoe is a brilliant idea. When his feet gets bigger, just need to loosen them, but of course it has it’s limit also. hey jo! ya lor so expensive….I almost fainted when I found out how much the shoes cost. Investment in his life lor. God is really good everyday I see new achievements. Thanks to all of U who pray for him faithfully! Love & miss U loads! that was soooooooo good… seeing nate walking up the stairs….. =) expensive shoes but worth it.